Also see FAQ for basic questions and Troubleshooting for tools to help diagnose problems. Please make sure that the IISExpress.exe task is shutdown (in task manager), before re-starting the service. This will be automatically included in the startup procedure. If you continue to have trouble, please email Support with your Detailed Logs and a description of your situation. Please make sure that the IISExpress.exe task is shutdown (in task manager), before re-starting the service. This task will be automatically started along with the server startup. Sometimes Windows Update still requires a restart / reboot. 1) Service startup errors will usually show additional logging details, please follow the steps here for Server Logging, and review the weblogs.txt file for any errors. 2) Rarely this could be an issue with IISExpress, a component that is started along with the Pleasant Server. To resolve simply try to repair the IISExpress install. Then re-install Pleasant Password Server. This will also install a new version of IISExpress. Click Start, type cmd, right-click Command Prompt, then click Run as administrator. From the prompt, run netstat -b -p TCP -q. If you see anything ending in :10001 in the Local Address column, either switch the software using 10001 to another port or switch Password Server itself. If you continue to have difficulty, please Contact us! Relevant only if upgrading from a version previous to 7.6.6. Click Reset Access Levels, which will also achieve the same results. Previously this setting was not required for granting/removing permissions, but has been changed for this version (as per Release Notes for 7.6.6). This will allow as for your expectations. If you have additional questions or concerns, please contact Support. Open SQLiteManager with a right-click, "Run as administrator". This avoids the "Database is read only" error. 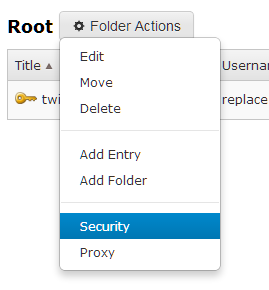 Re-add the User Access directly to the specific folder (or entry) you just restored. This should be the only issue your user's will have authenticating using the Authenticator apps. 1. Watch the clocks simultaneously count up the minutes and seconds. Set the time. B) Temporarily, the policy can be changed so that 2FA is not required for the user(s). Mobile devices can store multiple Google Authenticator secrets. If disabling Compatibility View doesn't solve your problem and you're running a recent version of Internet Explorer (IE9+), feel free to contact us for support. NOTE: Internet Explorer may sometimes automatically enable Compatibility View for Intranet. Find Windows PowerShell on your system (in Server 2012 R2, it may already be in your taskbar). Right-click on the PowerShell icon and select "Run as Administrator". Press enter. You should get a message that the command was successful. Close the PowerShell window and run the Pleasant Password Server installer. It should now install successfully. Make sure the user is a member of a role that has permission to access those features. Users may need to sign out and sign back in for permission changes to take effect. SQLite only understands upper/lower case for ASCII characters by default. The LIKE operator is case sensitive by default for unicode characters that are beyond the ASCII range. Using IIS as a Reverse Proxy: some customers may wish to know that it is also possible to setup a new IIS site and redirect the incoming TCP requests to the Password Server's IIS Express. This effectively makes IIS a reverse proxy. Press CTRL once to fix the keyboard. Details: Windows 8/8.1/10 will sometimes mistakenly behave as though CTRL is being held down on the login screen. Because the browser opened by the Reset Client ignores any keys pressed while CTRL is held down, this can make it seem like the keyboard has stopped working. Pressing CTRL forces Windows to acknowledge that CTRL is not being held down. Verify that you have .NET Framework ≥ 4.5 installed by following these instructions. "Connecting to a new server for the first time..."
This is designed this way by KeePass after some consideration, and there is a KeePass explanation for choosing this design (included below). KeePass client: an open dialog disables vault time-out until user closes it. Web client: an open dialog does effect the time-out with a save change message, and does not allow the user to save changes or open other entries, etc. Users can be reminded to close Vault credentials after use. KeePass automatically tries to lock its workspace when Windows is locked, with one exception: when a KeePass sub-dialog (like the 'Edit Entry' window) is currently opened, the workspace is not locked. To understand why this behavior makes sense, it is first important to know what happens when the workspace is locked. When locking, KeePass completely closes the database and only remembers several view parameters, like the last selected group, the top visible entry, selected entries, etc. From a security point of view, this achieves best security possible: breaking a locked workspace is equal to breaking the database itself. Do not save the database and lock. In this case, all unsaved data of the database would be lost. This not only applies to the data entered in the current dialog, but to all other entries that have been modified previously. Save the database and lock. In this case, possibly unwanted changes are saved. Often you open files, try something, having in mind that you can just close the file without saving the changes. KeePass has an option 'Automatically save database when KeePass closes or the workspace is locked'. If this option is enabled and no sub-dialog is open, it's clear what to do: try to save the database and if successful: lock the workspace. But what to do with the unsaved changes in the sub-dialog? Should it be saved automatically, taking away the possibility of pressing the 'Cancel' button? Save to a temporary location and lock. While this sounds the best alternative at first glance, there are several problems with it, too. First of all, saving to a temporary location could fail (for example there could be too few disk space or some other program like virus scanner could have blocked it). Secondly, saving to a temporary location isn't uncritical from a security point of view. When having to choose such a location, mostly the user's temporary directory on the hard disk is chosen (because it likely has enough free space, required rights for access, etc.). Therefore, KeePass databases could be leaked and accumulated there. It's not clear what should happen if the computer is shutdown or crashes while being locked. When the database is opened the next time, should it use the database stored in the temporary directory instead? What should happen if the 'real' database has been modified in the meanwhile (quite a realistic situation if you're carrying your database on an USB stick)? When Windows is locked and a KeePass sub-dialog is opened, the KeePass workspace is not locked. This simple concept avoids all the problems above. The user is responsible for the state of the program. Security consequence: the database is left open when Windows locks. Normally, you are the only one who can log back in to Windows. When someone else logs in (like administrator), he can't use your programs anyway. By default, KeePass keeps in-memory passwords encrypted, therefore it does not matter if Windows caches the process to disk at some time. So, your passwords are pretty safe anyway. The RDP SSO Client relies on the existence of a default settings file for RDP that will not exist if the user currently logged into the machine has never used Remote Desktop Connection on that machine before. Start up Remote Desktop Connection and connect to another machine to make sure that defaults are established, then try the Launch RDP SSO link again. Please check all your settings. If the problem persists, please provide us with screenshots of your settings when contacting us for support and what you are doing in the browser or terminal (confidential info blurred). Some users have reported that after upgrading from version 6 to 7 their user login times have drastically increased, even when no changes have been made to the AD/LDAP directory settings. The slowdown is caused by a change in the way Password Server tracks imported users and groups (more details). Specifying an OU for Pleasant Password Server users should speed up logins significantly. Only quering the targeted OU is allows the permissions check to occur much faster, speeding up the end-user experience. See this page for factors affecting the speed of Password Server or clients. Some users have reported that after upgrading, the Home screen does not finish loading / stays empty. To adjust for users to be automatically logged out the user after a specific amount of time. Set the timeout to the appropriate amount. Note: For Web clients in versions 7.6 and older, you will need to sign out for this policy to take effect. KeePass (option) - Automatic workspace lock/etc.